The ongoing celebrations of the 450th anniversary of the birth of the great Italian composer include a boxed set of William Christie and Les Arts Florissants and treatments of the tale of Orfeo with Philippe Jarousky. I. 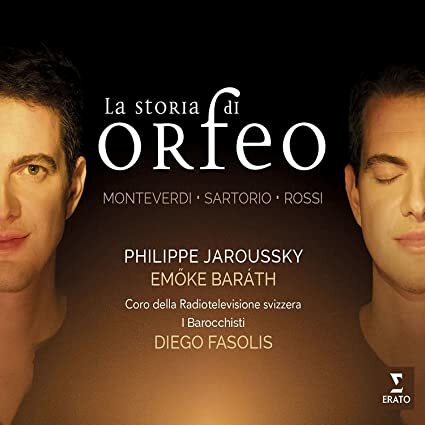 La storia di Orfeo (Philippe Jaroussky, ct./Emőke Baráth, s./Coro della Radiotelevsione Svizzera/I Barocchisti/Diego Fasolis). Erato CD 0190295851903. With Philippe Jaroussky’s new album, Storia di Orfeo, the French countertenor realises a long-held dream: to portray the mythic Orpheus – divine musician who ventures into the underworld to retrieve his beloved wife Eurydice from the clutches of death – in his many guises, an inspiration for the very first opera and beyond. He is joined by sublime soprano Emőke Baráth and period-instrument ensemble par excellence I Barocchisti with Diego Fasolis at the helm. A journey to the beginnings of opera, to the Italian Baroque, to the underworld and back. II. 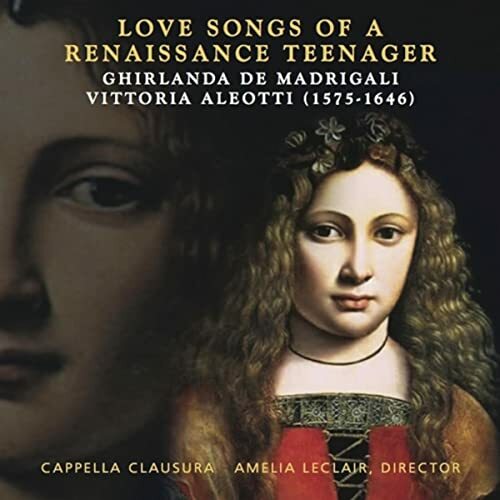 Monteverdi—Madrigali & Selva Morale (Les Arts Florissants/William Christie). Harmonia Mundi CDHMX 2908772.75. This box set assembles the complete Monteverdi recordings that William Christie and Les Arts Florissants made for harmonia mundi over fifteen years. Together, they constantly refreshed their inspiration at the wellspring of the composer's finest and most famous madrigals, with a memorable incursion into the sacred repertory with the Selva morale. CAPPELLA CLAUSURA is an ensemble of professional singers and instrumentalist, founded in 2004 to research and perform music by women composers. We are among a small handful of ensembles worldwide dedicated to this mission. Our tag line is "twelve centuries of new music", and indeed, most of this music, especially that written many years ago, is new to modern audiences. We have performed chant by the Byzantine nun, Kassia; the dramatic liturgical music of Hildegard von Bingen; the provocative music of the Trouvères/Trobairitz (female troubadours); and we have presented the modern premieres of music by composers from the Renaissance to today such as Sulpitia Cesis, Chiara Cozzolani, Marianna von Martines, Isabella Leonarda, Fanny Mendelssohn Hensel, Erma Woll, Rebecca Clarke, Patricia Van Ness, and Hilary Tann. We have produced more than thirty programs to date of music by women composers, and have not run out. Many, many women wrote music, but were either spurned or ignored by history, even if published in their day. Our mission is to bring those composers and their music to audiences – and into the established musical canon – not because it's politically correct, but because the music we choose is beautiful and expertly crafted, and calls out to be heard. For this recording of Aleotti’s “Ghirlanda de Madrigali”, we have twelve singers, three on a part, singing with gusto and passion. These are not your typical "early music" voices. We believe that the music of the Italian Renaissance would have been as passionate as the music of Italy has always been, and our singers have the skills, technique, and beauty of tone required to sing this music and this language. We are honored that two of the scholars most associated with this field – Drs. Richard Shindle and Ann Carruthers, of Kent State University – have shared their insights and an early transcription of the music with us and have given their blessings to this project. Vittoria Aleotti was born in Ferrara, the second daughter of Giovanni Battista Aleotti, a prominent architect at the Court of Duke Alfonso d’Este II. In his letter of dedication to Vittoria’s book of madrigals, Giovanni states that while the eldest of his five daughters was studying music with Alessandro Milleville, his second daughter, Vittoria, then a girl of four, was always present and observing, and, after a year, nature had “so loosened her hands that she began to play the harpsichord to the astonishment of her parents, and also that of the teacher himself.” Milleville began to teach this gifted child and commended her to further study with his own teacher, Ercole Pasquini, a leading Italian composer and organist. After two years, it was suggested to send Vittoria to live and study at the Convent of San Vito in Ferrara, famous for its musical training and performance. After several years there, at the age of fourteen, Vittoria decided to take vows as a nun at San Vito and to devote herself to religious life. Meanwhile, on seeing the progress she was making in music theory, her father obtained some madrigal texts of the court poet Giovanni Battista Guarini for Vittoria to set to music. When Count del Zaffo of Venice visited during Holy week of 1593, he was shown some of the madrigals, and was so impressed that he decided to have them published. When Vittoria was approached about publication, she said she no longer cared about worldly things and left it her father to follow through as he saw fit. Ghirlanda de madrigali a quattro voci, di Vittoria Aleotti, was published in Venice by Giacomo Vincenti, MDXCIII. After the publication of her madrigals, Vittoria Aleotti was never heard from again. In the same year that the Ghirlanda de madrigali were brought out, Amadino published the first sacred book of music by a woman composer to appear in print, Sacrae cantiones quinque, septem, octo, & decem vocibus decantande, by a nun named Raffaella Aleotti, of the San Vito convent. This Raffaella, called “l’Argenta”, became renowne for her skill in playing the organ, harpsichord, trom- bone and other wind instruments, and for being Maestra of the ensemble of twenty- three nuns. She was Prioress at the convent for several years until her death. "Among the said nuns were excellent composers, the smoothest voices, and instrumentalists of rare quality, such as Catabene de’ Catabeni and Cassandra Pigna, good tenors; Alfonsa Trotti with a singular bass voice; and the aston- ishing Claudia Manfredi and Bartolomea Sorianti, very delicate sopranos; Raffaella de’Magnifici and another Catabene, excellent players of the Cor- netto, also playing every other sort of instrument. Olimpia Leoni, at present still living, plays with great agility a tenor viola, and sings contralto with great aptitude and excellent voice. And the most outstanding of all, and without equal in playing the organ, is Raffaella Aleotti, called l’Argenta, who is also expert in music theory; she has published various highly regarded motets and madrigals". Given the circumstantial evidence, supported by a reading of her father’s will and the baptismal records of his five daughters, we may assume that Vittoria Aleotti, the second daughter of Giovanni, took vows as a nun in 1589 at the age of fourteen, and at that time adopted the name Raffaella. In the letter of dedication to Ghirlanda de Madrigali of Vittoria Aleotti (to use her secular name), her father stated that he had asked the poet Giovanni Battista Guarini to provide some of the texts. Guarini was noted for his pastoral drama Il pastor fido (pub. 1590), an important source of madrigal texts set by many noted madrigalists including Luca Marenzio and Claudio Monteverdi. A number of Guarini’s poems had been in circulation, but it was not until 1598 that an attempt was made to collect and publish them. Only four of the poems in this collection were set by Vittoria: “T’amo mia vita”, “Ch’io non t’ami cor mio”, “O dolc’anima mia”, and “Baciai per aver vita”. In addition, some of the anonymous texts appearing for the first time in Ghirlanda may also have been written by Guarini. Only one other poet has been identified, Annibale Pocaterra, a minor Ferrarese poet whose poems were published in 1611 including ”Io v’amo vita mia”. The concluding work is a madrigale spirituale, a setting of the sonnet “Se del tuo corpo hoggi le stampa horrenda”. As is customary in setting a sonnet, it is divided into two parts, the first part a setting of the ottava (rhyme scheme abba, abba), and the second of the sestina (cde, cde). At age fourteen, Vittoria/Raffaella was already a skilled and expressive composer. She takes full advantage of the textural possibilities within the limitations of four voices portraying, in particular, the contrasting affections in the longer lines. Each line of text, or half line, is given its own musical characterization relating to the various affections of the text. Her treatment of melody and dissonance, with few exceptions, is reflective of the older ideals of sixteenth-century counterpoint. One of these exceptions is encountered in the madrigal “Io v’amo vita mia” on the words “ch’i miei martire” (but of my sufferings). Reduced to a three voice texture, the top voice moves continually upward stepwise on the weak beat to form a suspension to the two lower voices moving upward in thirds on the strong beat, creating the highest tension on the word “martire” (suffering). This expressive technique is fully exploited in Ercole Pasquini’s Durezze e ligature, a composition for organ. This style of composition, emphasizing the use of dissonance and suspensions for organ, was described by Girolamo Diruta in his Il Transilvano (1593) as being appropri- ate for playing during the elevation of the mass. It was often associated with the disposition from the cross. It was a style that was fully exploited in the seventeenth century, and the earliest examples known are those by Pasquini. Vittoria obviously picked up on this technique from her teacher. Vittoria’s approach toward rhythm and harmony, like Pasquini’s, anticipates much that will become standard practice in the next century. 12. Amor Mio, Perché Piangi? 16. Ch'io Non T'ami, Cor Mio?